Home / its more fun with philip / philip abadicio / press release / It’s More Fun with Philip: Ang Lifestyle Show ng Bayan! It’s More Fun with Philip: Ang Lifestyle Show ng Bayan! For years, Philip Abadicio has always been associated with the success of the products and brands he launched for his clients. As a PR practitioner, he established RPA & Communicate where he mastered the ropes of the lifestyle industry. Thus, it gave him the chance to hobnob with some of the country’s known celebrities in society, showbiz, business, politics and media. It also brought out the friendliest and most intuitive side of his personality as captured on-cam in his latest quest as lifestyle TV host. Now on its second season, It’s More Fun with Philip: Ang Lifestyle Show ng Bayan! is on its second season and telecast every Sunday 9:30 pm, on TV5’s news channel, Aksyon TV (with a replay every Tuesday, 9:30 pm and Saturday, 5 pm). With his renewed contract with the network, Philip has been given an assurance of his status as the only TV show and host that paves the way for lifestyle to be more interesting and within reach of all Filipinos. Some people say that Philip Abadicio is the Boy Abunda of TV5. “Wow! What an honor to be compared with my friend, Boy Abunda! But our show is really not an entertainment program but a lifestyle show that makes the audience experience the delicious food we eat, the wonderful places we visit, the latest gadgets we try, the latest fashion, the beauty fixes, and the spa treatments we enjoyed. It’s a show that gives the audience the chance to win these experiences and thus, share with them all the lifestyle aspects we featured in the show,” relates the fast-rising TV host. There are others who have compared Philip Abadicio with Tim Yap. “Again, I don’t know how I can measure up to another good friend, Tim Yap!” As a lifestyle host, Philip believes that there are a lot of things to be discovered by Filipinos from all walks of life. “A good lifestyle,” he says, “must not only be enjoyed by people who can afford, but must also be made relevant to all our kapatid here and abroad.” It’s an eye-opener on how life can be lived in style and with loads of fun. “We hope to provide a lifestyle show where we all learn and be more conscious of the beautiful, inspiring and delicious things around us. It’s a show that I’m hoping will educate, entertain and inspire all of us,” he explains. It’s More Fun with Philip: Ang Lifestyle Show ng Bayan! is visually appealing, culturally enriching, and gastronomically appetizing with the different segments in every episode such as Bentang Bago, a showcase of the hippest trends, newest dining options, chill spots, fitness forays, and other fab finds in the metro. It is more interactive as the host gives the viewers a chance to sample the featured items by simply tweeting, sharing their comments on social media or texting. Napasubo Ka! Is a segment where people from different walks of life would personally try the featured products or services, while Ang Hamon poses a daring challenge to Philip, may it be doing odd jobs or finishing a specific task. 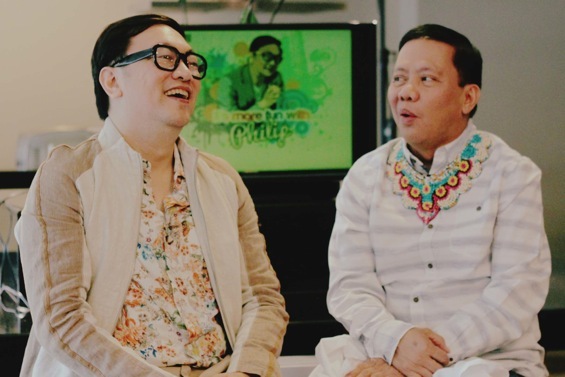 Segments like Galaw-galaw and Kuwentuhang Kumot are more intimate, where a spill-all interview with the guest co-host is done under the blanket with the slogan: Iba ang kwentuhan sa loob ng kumot. Even the bumper’s segments are hilariously smart, like I Saw the Sign, Whatchathink? (Asking passersby on their thoughts about trivial questions), Ano Kaya Kung… (Features short and snappy challenges that we usually think about but never tried), and Weblog (discusses news bits on the online lifestyle source, www.StyleRPA.com, of which Philip Abadicio is editor-in-chief). It’s More Fun with Philip: Ang Lifestyle Show ng Bayan! is directed by Mike Canlas and written by Lucci Coral. Aksyon TV is on Channel 41 on UHF or free TV, Channel 78 on Destiny Cable, Channel 59 on Sky Cable, and Channel 1 on Cignal. Get ready as Philip provides you with a viewing experience full of fun, information and entertainment as he brings you around Metro Manila and other parts of the country, and maybe even the world, with style. 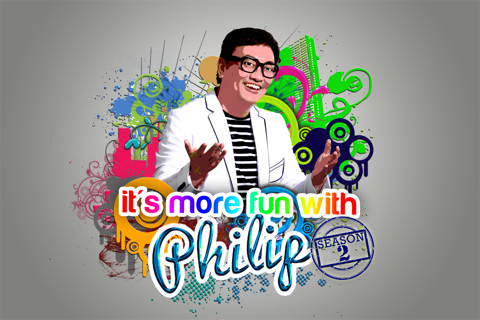 For daily updates on the past and current episodes including ongoing contests and winners, follow @PhilipAbadicio on Twitter and Instagram, and like www.facebook.com/ItsMoreFunWithPhilip.